Let's Do It for ME! : £25,000 target passed! We are pleased to announce a new total of funds raised so far of £25,161. This takes us past the quarter way point on our way to raising the required £100,000. 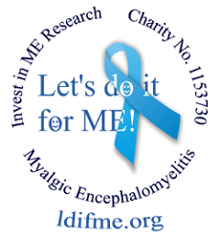 Thank you to everyone who's helped us get this far, we'd love to raise the remaining £75,000 in time for the Seventh Annual Invest in ME International Biomedical Conference which will take place on 1st June - more details. Can you help? Please take a look at the ways you can help on our How to Help page. Are you able to donate? See the donation options here. Don't forget to sign up with Everyclick and Easyfundraising to raise funds for FREE while you shop online and search the web - more details can be found under RAISE FUNDS FOR FREE! here. Please contact us at fundraising4me@gmail.com if you have any questions or suggestions for the campaign team. Let's keep doing it for ME!